Hunt Bedding. Target Does. Sit All Day. Rattle & Grunt. While there's nothing wrong with tried-and-true rut tactics, we asked the country's best deer hunters: "So, what else?" These guys regularly dig deep and shoot slammer November bucks, so how exactly do they do it? How do they take the crapshoot that is seeking and chasing in the whitetail woods and turn it into a hard plan for pre-Thanksgiving success. The answers, it turns out, are mostly about preparation, tactics, and the mental game that's targeting mature deer. Taken together, they're a new set of commandments for hunting the whitetail rut. Now do yourself a favor and chisel them in stone. There's a false belief that bucks run nonstop for three weeks in November. Nothing could be further from the truth said big deer-slayer Shawn Luchtel. The rut is a marathon, not a sprint. Mature bucks bed down and rest several times in a 24-hour period during the rut, and above-average daytime temperatures, coupled with below-average nights, can push much of that downtime into daylight hours, as much of the country saw in 2015. "I pay very close attention to the weather and pressure systems, even in the middle of the rut," Luchtel said. "A high-pressure system following a cold front with a north wind seems to make buck activity much better. Heat is a rut killer." Every day in early November is not equal. The better the cold front, the bigger the weather change, the better the deer activity, so if you have limited days to hunt, let the Weather Channel guide you. The rut can be highly frustrating because oftentimes hunters will see tons of deer but not that shooter buck they've been scouting all season long. Whitetail fanatic and proven big-deer slayer Dan Perez says that seeing little bucks is a good thing, as it shows you're in a spot with high deer activity. The key is to not get discouraged. "In my mind, every time a buck passes my stand and I don't shoot him because he's not the right buck, I'm much better off," Luchtel said. "First, I just learned that I'm undetected. Second, I just reduced the number of bucks on that property that need to walk by. It's like a formula, in my mind. If eight bucks go by, that ninth deer will be 5.5 years old or better." Just wait it out. "Every buck I've killed at 9 a.m. or 10 a.m. or 11 a.m. has been trailing a doe that moved through 30 minutes or an hour before. If I'm frustrated and off my game because I'm not seeing good deer early, I'm in no position to make a killing shot when it counts." With does running and bucks chasing, it's easy to get excited during the rut. Montana guide Keith Miller tells his hunters to tone it back. In his area, where the country is open and visibility high, he recommends only calling to shooter bucks. Leave the skippers and does alone. "Nine out of 10 deer are going to circle downwind from you, and if they scent a hunter, even if they don't snort, they're going to secrete odor from the interdigital gland, between their toes, that mature deer will key into and hang up until they figure what happened." This applies back East, too, in crowded timber hunts where visibility is low. Blind calling does wonders, as it can pull deer out of the ether and into bow range, but as soon as you ID that fork-horn, shut the heck up. Fun as it may be to toy with little deer, you don't want to educate the neighborhood. And if the Big 10 does show up, you don't want other deer hanging around while you draw. "More eyes equal more problems." Miller said. Maine big woods buck hunter Hal Blood changes his ground game when the rut is on, running down doe tracks until he finds sign of a breeding party. It's the one time of year when bucks aren't highly aware of their backtrack. "You'll know breeding sign when you see it. It's a mess of tracks everywhere," Blood said. "Slow right down and start looking. They may run a big loop and come right back at you." Stand hunters can look for the same thing while moving in and out of the woods — or while changing stand locations — and make a ground stalk. Blood will get on the downwind side of the breeding sign and work a loop along the outside edge, which could span a couple hundred yards or a quarter-mile. He looks for good cover: thick ridgelines, green knobs, and thickets of brush where deer feel most secure. "They don't want to breed right out in the open," Blood said. "Follow them into the bedroom." 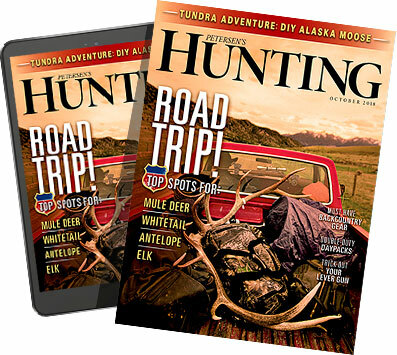 Father and son team David and Jeff Lindsey have a long history of shooting big deer, and when the rut is in full swing, there's no place they'd rather sit than a tried-and-true travel corridor. "A buck will sit on a doe for 48 to 72 hours, but in that time, they still need to eat and rest, especially the doe, and she'll often drag that buck along well-traveled routes," Jeff said. Anything from a classic timber funnel in ag country to a saddle across a steep ridgeline to manmade pinch points of roads and homes in the burbs can concentrate deer and produce a daylight buck sighting. In a way, it's not very different from a strong early- or late-season setup, but Jeff focuses on morning-only hunts. "I don't hunt timber in the evenings," he said, "because I don't want to be banging through the woods in the afternoon, but in the mornings we've had a lot of success moving in close on these travel corridors. Big steep ravines that deer will walk around and split ridge tops with lots of trails are ideal, and I might have 10 or 12 of these spots, but I focus only on my favorite one or two during the rut. The rut is such a mental game, I want to sit areas I have the most confidence in." "If you're looking for a real big buck, later in the rut is better." said legendary whitetail outfitter Tom Indrebo. Early in November, when most does are hot, bucks don't have to travel far to move from one hookup to the next. But later, when the great percentage of does are bred, they have to cover ground to find that next hot date. "Four- and five-year-old bucks are a different animal altogether, and they approach the rut differently than younger bucks," Indrebo said. "They'll lock down with a doe early, pushing away the smaller deer, then move on to the next closest option." This is why hunters often see tons of small bucks running wild in early November. They're bumping into does and being pushed off by more dominant bucks — pinballed from one hot spot to the next. But that all changes as the supply of does in estrus drops. "The benefit of being an outfitter is having dozens of eyes in the woods every year," Indrebo said. "That's taught me that later is better for a real big buck." On nearly all his hunts from Halloween through late November, renowned whitetail writer and editor Gordon Whittington hunts with a decoy. Typically, he runs a bedding doe decoy next to a standing buck, then grunts, wheezes, and rattles with conviction. "It's more an attitude than a tactic," he said. "Don't be shy." Whittington isn't afraid to push close on deer and force the action. "It often works better than the low-key, stealth-mode approach we advise and employ at other times." This does not mean throw caution to the wind. While bucks are definitely distracted during the rut, they still have noses, ears, and eyes, so hunters need to use common sense, too. "You'll hear people say the bucks are stupid during the rut, but that's not true at all," Whittington said. "They just have something more than survival on their mind. If they sense danger, they'll still hang up, which is why the decoy does so well. It's the closer and will often bring them into bow range." When deer are locked down and you can't buy a buck in the usual spots, Drury Dream Season hunter Doug Hampton looks for secluded out-of-the-way places: a small patch of timber in the middle of an ag field or a thick patch of cover in an otherwise open hardwood stand. "Bigger bucks tend to push does into smaller and smaller places, away from all the other bucks," Hampton said. "I actually watched a buck push a small doe to an island out in the Mississippi River. They want seclusion, a motel room out of town, so the other deer don't know what they're doing." You'll never know when a buck is going to break free and go searching for another doe, so Hampton likes to set up on the most likely avenue out of the hiding spot. Find that secluded honeymoon suite and you'll find your shooter buck. Dr. Deer, the nationally renowned whitetail expert, dials down the best days to sit the rut on every property he hunts by recording first fawn sightings in the spring. "When I first see fawns, I backdate that by 200 days and come up with when the peak breeding took place," Kroll said. "Then I back 10 days off that and have an estimated time when activity is at its highest. That's the combat period when you see deer running everywhere." So if spring trail cameras pick up the first fawns on June 5th, peak breeding was roughly 200 days earlier, or on November 18th. (There are online date calculators that make calendar math easy.) Walk that peaking breeding date back 10 days and you get a chasing or combat phase of November 8th to November 18th. But what if your cameras weren't out in May and you spent all spring in the office saving vacation days? "There's always that day in early November when, all of a sudden, scrapes are everywhere," Kroll said. "That's the beginning of that 10-day window and when you want to be in the woods." Lots of scrapes signal that the combat period has begun, and it's time to break out the rattling antlers. Yes, some scrapes are made as early as September, but that's very different from the huge boost typically found sometime during that first week of November, when you can't walk 100 yards without finding torn earth. That's the bucks telling you it's time to get in a tree. The rut is a grind. Chess-like tactics to triangulate big deer in the early and late seasons go out the window and it's all about logging time on stand, said management expert Neil Dougherty. "You have to be mentally prepared and technically ready to go the distance," he said. Dougherty plans for November by mapping grid lines on all his properties and commits to hunt each block at least three days in a row. It's tempting to chase camera data, Dougherty said, "but where a buck worked yesterday, he likely won't be today, and you can spend all of November a day behind a mature deer if you're not careful." Getting ahead of that buck can often mean long hours of little activity. Dougherty tempers the mental fatigue of watching squirrels with a Kindle or tablet, and reads when it's slow, but not before he has the mechanics of his shot completely worked out. "When the action happens, it happens fast, and you need to be technically perfect in your hunt execution," Dougherty said. "How are you going to stop that running deer? What pocket gets the grunt tube? What are the yardages on the three likely shooting lanes? Everything needs to be mapped out in your head, and you need to stay sharp." Bring food and extra clothing if it's cold&apos;¦whatever it takes to keep your mind awake and in the game.